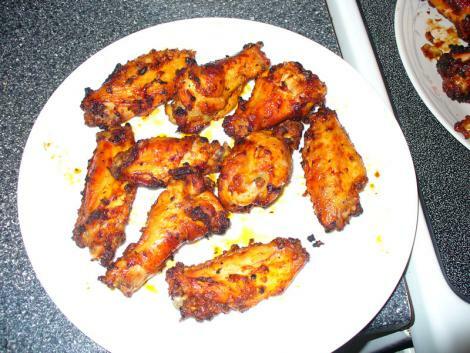 I made chicken wings last night and I figured I'd share my latest recipe. 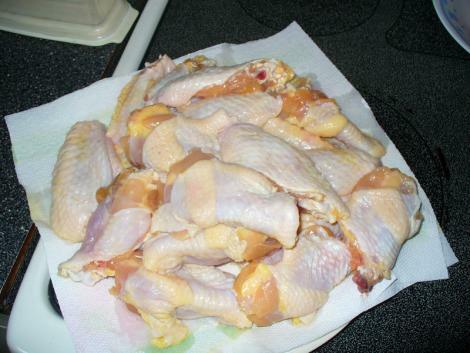 1) Rinse off the chicken winds and cut them into three pieces, discarding the tips. I'm using a 4.5 lb package of chicken wings because half of this package are used for my Honey BBQ wings and the other half I used a McCormick Buffalo Wings Garlic and Herb dry rub. 2) Pat the chicken wings dry with paper towels. 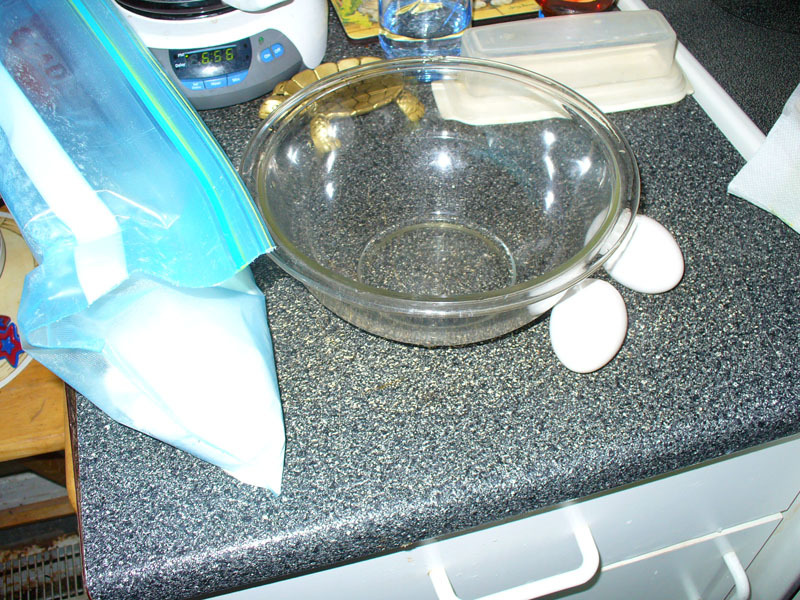 3) Crack 3 eggs into a bowel and wisk it up to make an egg wash.
4) Once the chicken wings are mostly dry, dip them in a ziploc bag of flour to coat them, then coat both sides into the egg wash and then put them back into the flour so you have a double coating of flour. 5) Put your wings on your grill at a low temperature and cook them for about 15 minutes, flipping them once. 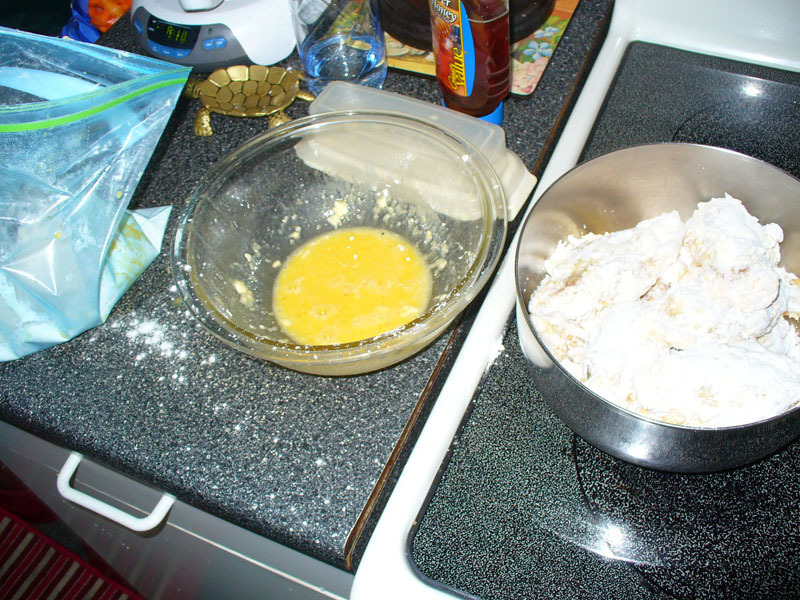 Notice that the other half of my chicken wings look different (the ones on the left), those are the ones I patted dry and coated with the McCormick mix. 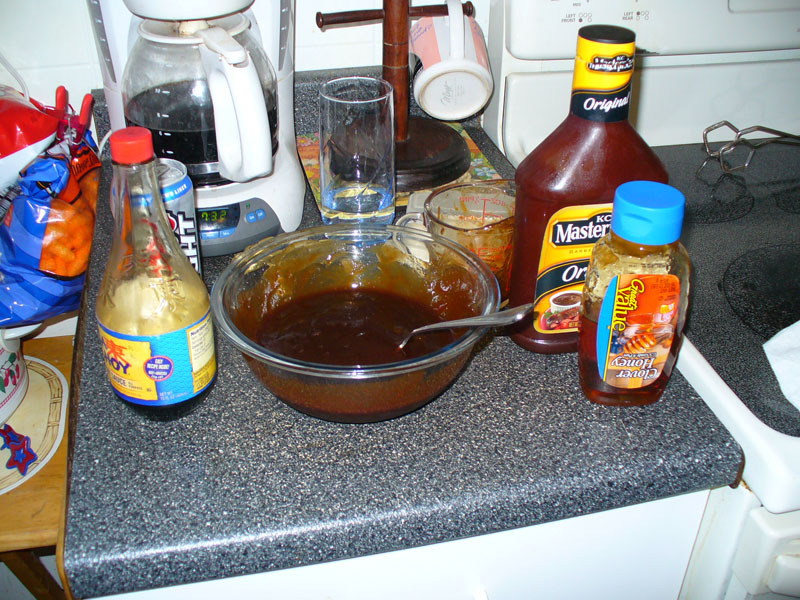 6) While the chicken wings are cooking, mix the three sauce ingredients together. You can add more honey or soy sauce to taste. With the mix I made it turned out to be a bit more of a honey/sweet&tangy sauce. 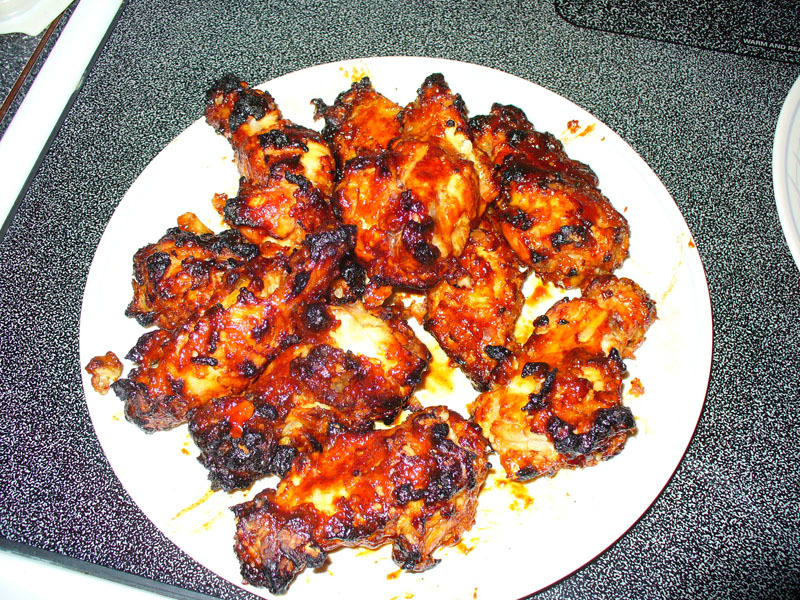 7) After the first 15/20 minutes take your flour coated wings off the grill (I did it right at the grill, one at a time) and dip them in your honey bbq sauce. Then put them back on the grill and turn the temp up to medium. 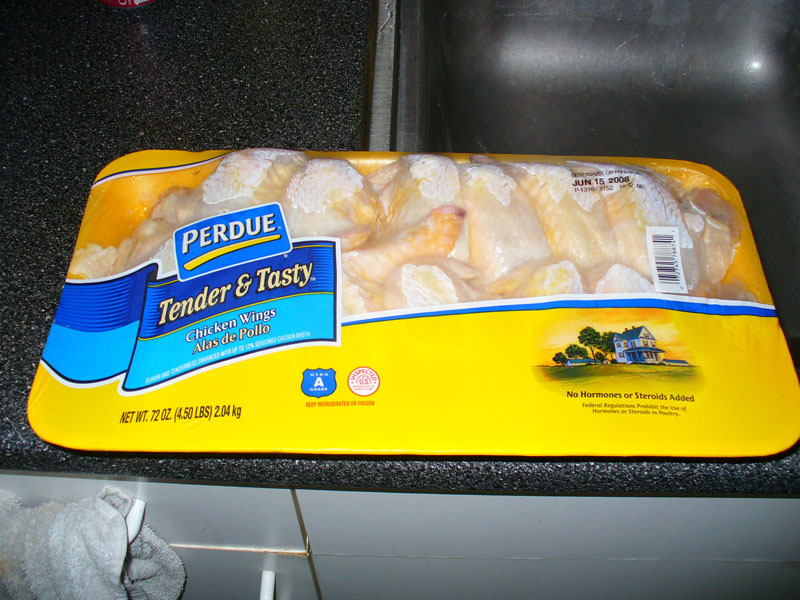 Keep flipping them every 5 minutes or so and cook your wings until their internal temperature is 180 degrees. It takes about a 1/2 hour to 40 minutes. 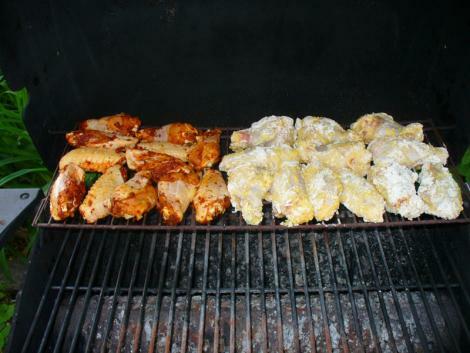 To do this easier on a grill, cook only a 2 - 2.5 lb of chicken wings at a time and place them on the top far left of the grill. Turn off the burner directly below the wings, the left one and crank the temp on the right burner to full. Because the chicken wings get cooked with indirect heat you don't need to keep flipping them constantly and they should cook faster. 8) Finished Honey BBQ Wings. They look burntish, but they taste good to me. The only problem I had was that the wings just weren't crispy. I think breaded wings cook best fried, but in the end grilled wings turned out pretty decent and the sauce tastes quite good. 9) Finished McCormick Garlic and Herb Wings. Cooking these on the grill, they turned out very crispy and tasty. Of course being a dry rub, there was no flour or sauce involved to moisten the skin. 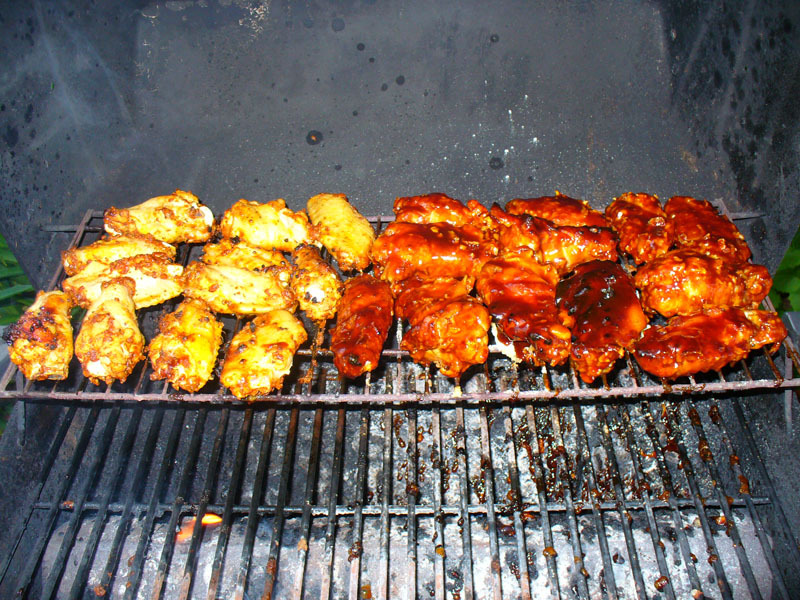 I honestly think for cooking wings on the grill a dry rub has a much better result.